I’m originally from Indiana, where it’s crazy humid. I grew up in the mountains of Northern Colorado, where the winters are long, crazy cold & windy. So I figured I knew what I was getting into when we moved to South Dakota. Turns out I didn’t quite have it all figured out. The combination of cold, wind, and humidity are just plain bone chilling! People warned us- and it’s not that we didn’t listen, because we did. But you never REALLY know until you experience it. We are just getting into the start of the colder weather- it’s not truly cold yet. But while the temperature claims to be in the 40’s the windchill makes it feel at least 15 degrees colder. And as for the wind… well it blows what they get in Colorado and Wyoming pretty much out of the water. We’re kind of in the apex of the wind curve, if you will- so it’s strongest blowing across our little corner of the world. That being the case, it’s a good thing I have a cache of stick-to-your-ribs, warm-you-right-down-to-your-soul winter favorites that I can make to keep my family’s stomachs cozy and full! This soup is part of that cache. 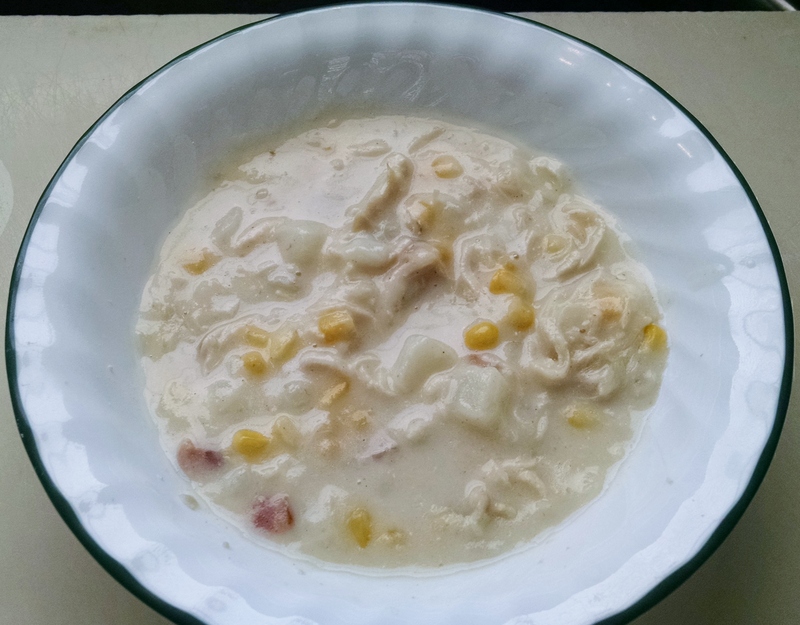 I found the original on a recipe site and it was called something like “chicken, bacon, corn, and potato chowder”. It was ok- but not really what my family called stellar. And it certainly wasn’t chowder. It was barely thicker than a regular broth soup, despite having thickener in the recipe. So I fiddled around with it a bit and came up with a good soup that my family likes. I still use some flour to make it thicker than a regular soup, but it’s still definitely soup. If you wanted to make it a chowder, you certainly could- just use more fat and flour to make the roux thicker. As the name implies, I am using bacon. HOWEVER you could easily substitute ham or even smoked sausage or kielbasa- any of those would give the soup great flavor. And they are a bit cheaper than bacon (about $5 a pound in my neck of the woods! ), which helps when making this as Broke Food. If you make one of those substitutions you’ll need to use butter or olive oil to saute the onion. As for the potatoes, yes; those are frozen potato cubes, better known as Southern Style Hash Browns. They work a treat in soups and stews, actually. Most of the time I use actual whole potatoes from the produce section. But sometimes I just really need things to be easy and quick. So if you have frozen potatoes, now is the time to use them! For the chicken, I simmered one chicken breast (about half a pound- I’m making a half batch because it’s just the kids & I) in the broth I would be using for the soup for about 2 hours so it would shred super easily… and then realized I didn’t have cream for the finish… and THEN realized I didn’t have an inch of space for a container of broth in the fridge. Yes; I had to throw it away 😦 So if you have your poop in a group better than I did, simmer your chicken breast in the broth you will use for the soup (adding water at the end to make up for any evaporation). Or you could use leftover chicken- that works super well too. Moving on! Cook your bacon over medium low heat to render as much fat out of it as you can. Drain the bacon with a slotted spoon and set it aside. Reserve about 1/3 cup or 5 tablespoons (which will probably be all of it, but you never know). If you have extra, put it in the fridge for future use. (If you use ham or sausage of some kind, now would be the time to fry it as well. Sometimes those things can be greasy and you want the fat rendered out before you put it in the soup.) 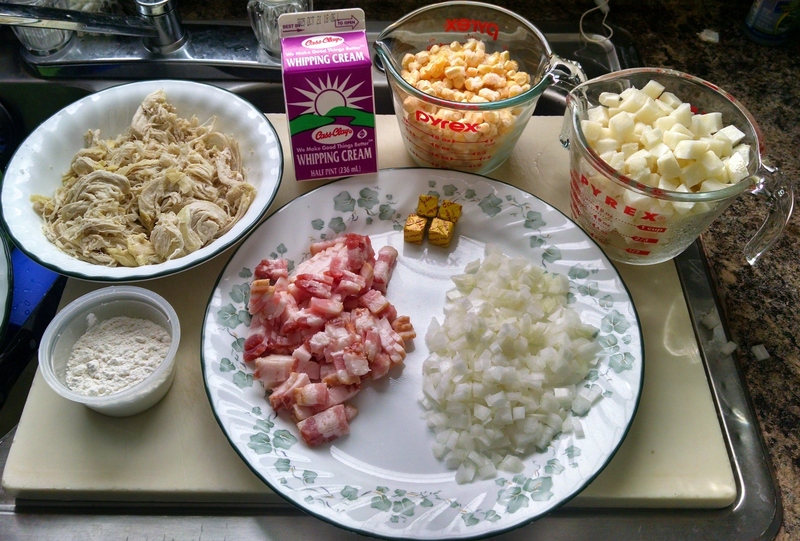 Saute your diced onion in the bacon fat on medium until soft, 3-5 minutes. Sprinkle the flour over the onion and stir. Cook the roux for about a minute to get rid of the raw flour taste, and then whisk in the broth. Add all of the ingredients except the cream, salt, and white pepper. Bring the pot to a boil, reduce to a simmer, cover, and let go for about 10-15 minutes, stirring occasionally- it’s going to want to stick because of the roux. At this point all you’re doing is cooking the potatoes and corn through. Once those 2 are done, shut the stove off and stir in the cream. Give the soup a taste and add salt & white pepper to your liking. Remember to use white and not black pepper- no one likes little black floaties in their light colored soup! *In a soup pot, cook the bacon over medium low heat to render as much fat as possible. *Remove the bacon with a slotted spoon and set aside. Measure out 1/3 C of fat and put the rest in the fridge for another use. *In the same unwashed soup pot, saute the onions in the 1/3 C bacon fat on medium heat until they are soft- about 3-5 minutes. *Sprinkle the flour over the onions and bacon fat and stir for about 2 minutes. *Whisk in the chicken broth until smooth. *Add all ingredients except cream, salt, and pepper. *Cover and bring to a boil, then back down to a simmer. *Simmer 10-20 minutes, or until the potatoes are soft. 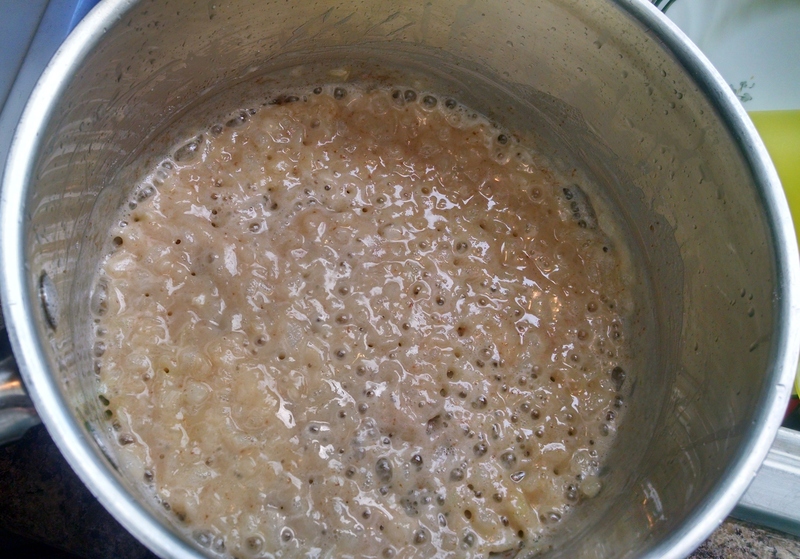 Stir fairly often- the roux will make the soup want to stick to the bottom. *When the potatoes are done, add the cream and taste. Add salt and white pepper to taste. It’s An Honor- An Appearance Outside My Own Blog!